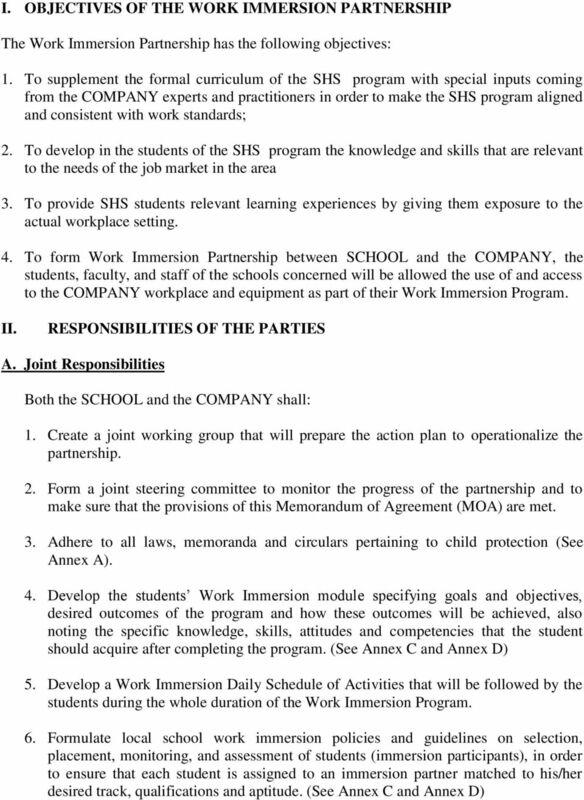 Download "MEMORANDUM OF AGREEMENT FOR WORK IMMERSION PARTNERSHIP"
2 WHEREAS, to achieve this objective, the SCHOOL needs to enter into a Work Immersion Partnership with the COMPANY; WHEREAS, the COMPANY operates in the area where the School is located and has offices, facilities, project sites, and expertise that it can make available to the School for purposes of student work immersion; WHEREAS, the COMPANY considers going into a work immersion partnership with the School as part of its mission to create a positive impact on the community, especially the young people; WHEREAS, the COMPANY may avail of the revenue regulation no. 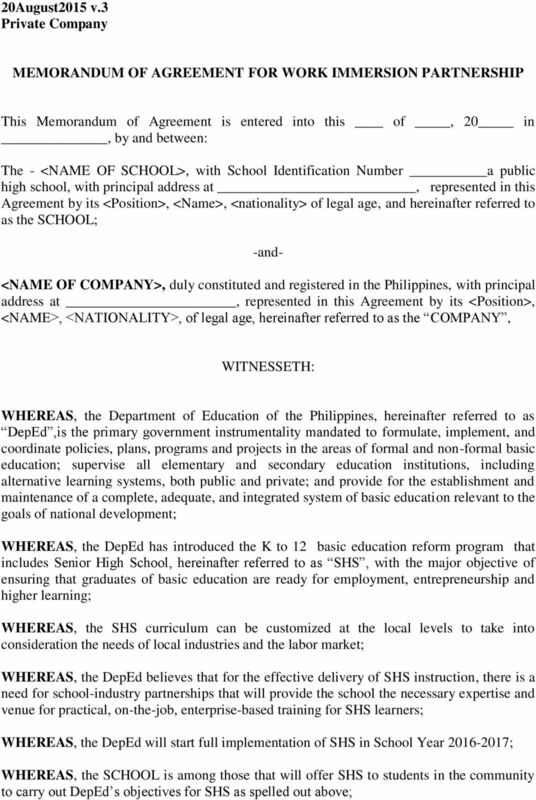 10 s implementing the tax incentives provision of R.A otherwise known as the Adopt-A- School Act of 1998; WHEREAS, the SCHOOL and the COMPANY, hereinafter collectively referred to as the parties, undertake to collaborate for the successful implementation of the SHS in <Municipality> cognizant of the need for special protection of the child and with the best interest of the SHS learner at heart; NOW, THEREFORE, for and in consideration of the foregoing premises, the PARTIES hereby agree as follows: DESCRIPTION OF THE WORK IMMERSION PROGRAM With the passage of the Enhanced Basic Education Act of 2013 or Republic Act 10533, the DepEd was tasked to implement the K to 12 Program, essentially adding two (2) years of specialization within the Basic Educational System; The DepEd designed the implementation of RA within the framework of increased community involvement in the learner s experience; With this premise, the DepEd, offers venues for various stakeholders to participate in the implementation of RA and, the same offer, accepted by the PARTIESs herein; The Work Immersion Program is one of the course requirements for graduation. A SHS student has to undergo work immersion in a business organization or establishment with work requirements related to the specialization. Through work immersion, the students are exposed to and are familiarized with the work-related environment related to their field of specialization. Specifically, the students are able to: 1. Gain relevant and practical industrial skills under the guidance of industry experts and workers; 2. Appreciate the importance and application of the principles and theories taught in the classroom; 3. Enhance their technical knowledge and skills; 4. Prepare them to meet the needs and challenges of employment, entrepreneurship, or higher education after their graduation. 4 B. Responsibilities of the School The SCHOOL shall: 1. Identify and indicate the SHS track/s, strand/s, and/or specialization/s which will be the subject of the partnership (See Annex D) 2. Make the needed adjustments to contextualize the SHS subjects based on inputs coming from the COMPANY. 3. Designate a person who will be in-charge of coordinating with the COMPANY and supervising the activities of the students for the duration of the Work Immersion Program. 4. Continue to exercise its Special Parental Authority under the Family Code over the Senior High School student under immersion in the premises of the partner. 5. Monitor each student s progress throughout the duration of the entire work immersion program so as to make sure that the tasks assigned to each student are meaningful, challenging, and applicable to his/her particular programs and are able to maximize the quality of the learning experience. 6. Provide the COMPANY an evaluation tool for the students immersion performance. 7. Issue a final grade to the student upon completion of the requirements within a prescribed period. 8. 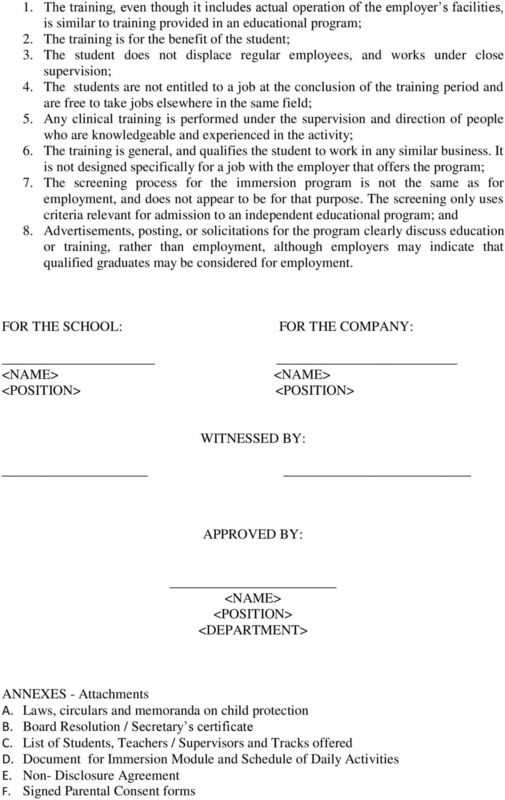 Ensure that the student will adhere to the non- disclosure policies of the COMPANY as agreed to by the School. (See Annex F) 9. Provide signed Consent forms from the parents as applicable. (See Annex G) 10. Provide the COMPANY a Certificate of Participation in the SHS program for whatever purpose it may serve. 11. Execute a deed of acceptance as a way of recognizing and acknowledging the donation/s received from the COMPANY. 12. Review, facilitate and endorse the application of the COMPANY to avail of the tax incentives/exemption as specified in the R.A otherwise known as The Adopt-A- School Act of C. The Company shall: 1. Assign a competent Immersion Coordinator from the COMPANY to liaise with the School and supervise the students without prejudice to the special parental authority of the school, its administrators and teachers for the duration of the work immersion program so as to ensure efficient implementation of all stages of the program. 5 2. Provide inputs into the curriculum through the discussions or workshops that DepEd will organize. 3. Lend its expertise by making available its resident resource persons to provide training to the students. 4. Allow the students to be deployed to the different sections/departments/project sites of the COMPANY based on the Work Immersion Daily Schedule of Activities. 5. Agree to the required number of hours of the immersion program set under the DepEd SHS curriculum. (See Annex C and D) 6. Provide immersion opportunities for <number of students> students for School Year ( See Annex C and Annex D) 7. Provide students with an orientation about the COMPANY, its line of business, and the work its employees do, and expose them to the various stakeholders of the community in which the COMPANY operates for the students to get a holistic understanding of its business. 8. Similarly ensure that students undergo training related to their course, and provide the students with work or activities that are varied and applicable to their field of study. 9. Make its workplace and facilities available to students, and shall similarly take all necessary action to ensure the safety of students within their areas of operation at all times, which shall include, but shall not be limited to, the provision for Personal Protective Equipment (PPE s), if applicable. Ensure that the students will not be exposed to hazardous materials and working environment throughout the duration of the immersion. 10. Evaluate students performance in the immersion venue by accomplishing provided evaluation tool 11. Issue a Certificate of Completion to the student trainees upon satisfactory compliance with all requirements of the program. 12. Execute a deed of donation in favor of DepEd for the completed Work Immersion Partnership. 13. 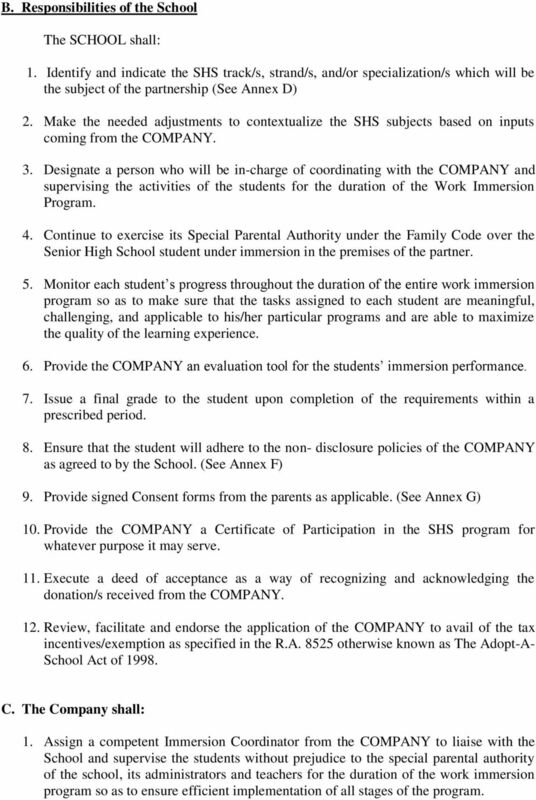 Submit to the Adopt-A-School Program Secretariat all pertinent documents in support of the amount specified/claimed for the tax exemption application of the COMPANY. III. EFFECTIVITY This agreement shall hold for the duration of the <from year-to year> Academic School Year and is renewable every year. The COMPANY and the SCHOOL shall submit their intention for renewal of this agreement through formal notice within thirty (30) days before the expiration of this Agreement. Agent's Name Insurance Agency, LLC. Agent's Address is a party to this Agreement and is hereinafter called the "Agent". AGENCY AGREEMENT The Company, designated as ABC Mutual Insurance Company, as now or hereafter constituted, its successors or assigns, is a party to this Agreement and is hereinafter referred to as "Company." 1.1 Certain software, known as SOFTWARE, was developed at STANFORD with grant support from the U.S. Government. What is the nature of the relationship between the intern and the employer? AGREEMENT FOR SERVICES BETWEEN [INSTITUTION] AND [CONTRACTOR] THIS AGREEMENT is made by and between [INSTITUTION] ( Institution ), and ( Contractor ).